For secure VPN using EAP authentication, import computer certificate in both TMG server. On the Forefront TMG server, click Start, point to Administrative Tools, and then click Computer Management. In the Computer Management console, in the tree, click System Tools, click Local Users and Groups, and then click Users. 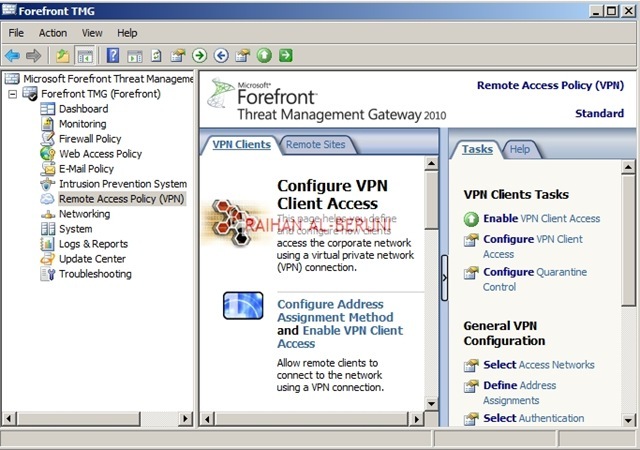 In the Forefront TMG Management console, in the tree, click Remote Access Policy (VPN). 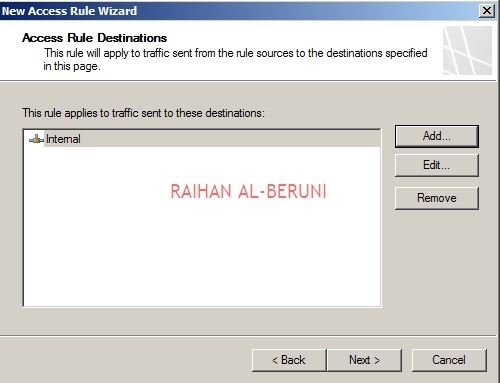 In the Create VPN Site-to-Site Connection wizard, follow the on-screen instructions, On the Welcome page, in the Site-to-Site network name text box, you must type the exact name of the remote network’s gateway. Add a range of IP addresses for remote site clients. If you don’t have load balancer then click next otherwise type the IP address of load balancer. 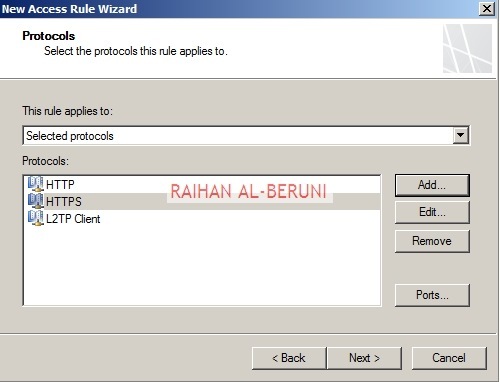 Create a network rule in next steps that include source and protocol type ad click next, click next. Apply Changes. Click ok. View rules applied in firewall. To view a summary of the VPN site-to-site network configuration, right click the selected network, and then click Site-to-Site Summary under the Remote Sites tab. Repeat similar steps in remote sites to complete site to site VPN. Click on System>Select TMG server>Click on Install Server Certificate as shown in picture and follow the prompt. On the Forefront TMG computer, click Start, click Administrative Tools, and then click Routing and Remote Access. In the Routing and Remote Access MMC snap-in, select the Network Interfaces node. When you applied the changes to the Forefront TMG configuration, a demand dial interface with the same name you gave the network was created. Select this demand dial interface, and then click Properties. On the Security tab, the advanced custom settings option should be selected. Click Settings to open Advanced Security Settings. Select the EAP you will be using, and then click Properties to configure EAP according to your EAP provider. In the Forefront TMG Management console, in the tree, click the Monitoring node. Session Type shows VPN Site-to-Site. 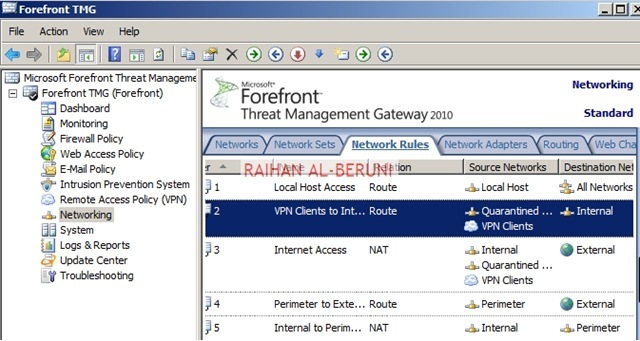 Client Host Name shows the remote VPN server’s public IP address (if the session was initiated by the local VPN server, this field will be empty). Client IP shows the IP address assigned for the VPN session. Application Name shows that this is a VPN connection and displays the protocol used for the connection. Application Name is not displayed by default. To add it, right-click one of the column headings in the Sessions tab, and click Application Name. On the Tasks tab, click Edit Filter. In the Edit Filter dialog box, in Filter by, select Session Type. In Condition, select Equals; and in Value, select VPN Remote Site. Click Add To List, and then click Start Query. You must click Start Query to save the filter. Forefront TMG is a member server. 1. open the Forefront TMG Management Console. Click Forefront TMG (Array Name) in the left pane. 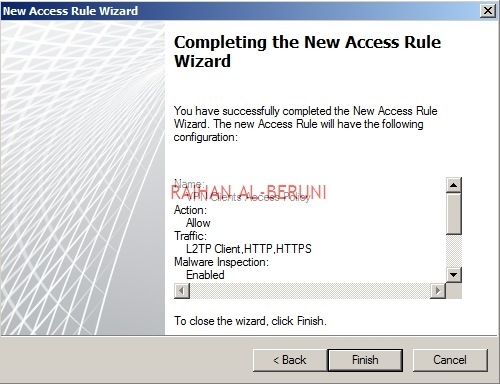 2.In the left pan click on Remote Access Policy>Click on Configure Address Assignment method. You will be presented with Remote Access Policy Property. Now follow the screenshots. 3. Add a range of IP addresses (Example:10.10.11.1-10.10.11.255) to be assigned by TMG server or assign internal DHCP server. 6. In the left pan click on Remote Access Policy, in the task pan>click on configure VPN Client Access. You will be presented with VPN Clients property. Check enable on general Tab. 7. In the Group Tab, Add Windows AD groups you allowed to access VPN. 9. In the User mapping, Check enable User Mapping and provide internal domain name. 10. Click Apply and ok. Apply changes. 11.In the left pan click on Networking, Click network Rules Tab. 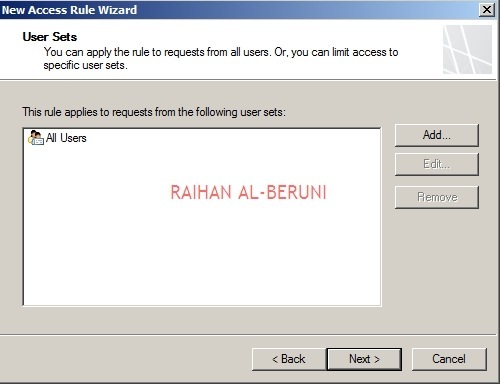 From the task pan, run new Create Network Rules wizard. 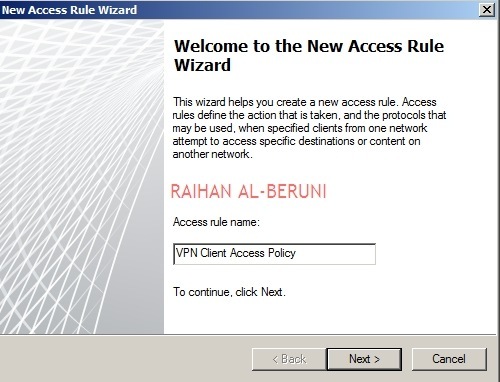 Create new network rules allowing VPN client access from external network to internal network. Select route relation between external and internal network. 12. In the left pan right click on Firewall Policy>Click New>Click new access Policy. Follow the screenshots. 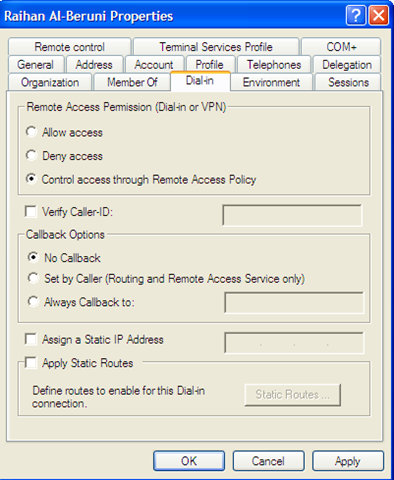 14. make sure you allow remote access in AD user Dial-in property. 15. Now create a dialler in Windows 7 machine shown below link. Log on to that machine using domain credentials and test VPN.